Melding today’s style with the safety that flameworkers need, these stylish plastic frame glasses are comfortable, lightweight, and feature polycarbonate lenses. Polycarbonate lenses are lightweight and scratch-resistant that filter sodium flare and UV similar to glass Didymium or ACE lenses. 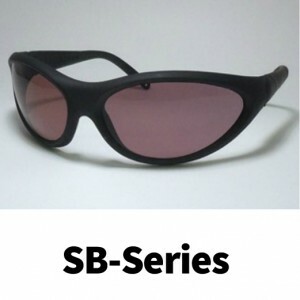 The biker frame glasses weigh 34 grams and have adjustable arms.